Kimberley Ultimate Cruise - When Only The Best Will Do! Kimberley Ultimate – when only the best will do! For more than 25 years North Star Cruises’ flagship adventure has been the Kimberley Ultimate Cruise! 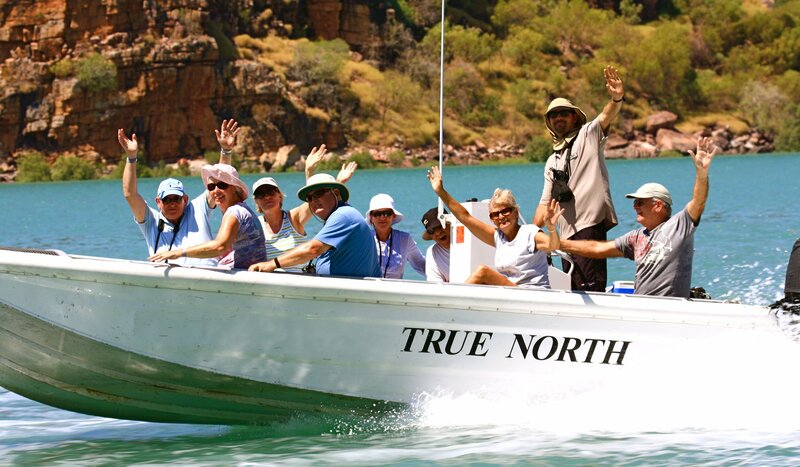 If you want not one heli-picnic but two – if you want more time for exploring, more time for fishing and, twice as many mouth-watering dining experiences – then the Kimberley Ultimate is the right TRUE NORTH cruise for you! And to find out why company biologist, Dr Andy Lewis, is looking forward to his Kimberley Ultimate adventures in 2015 see below. North Star Cruises’ company biologist Dr Andy Lewis first began as a specialist guide on the TRUE NORTH in 2006 and since then he has become a firm favourite with all our guests. Andy has an infectious enthusiasm for his work in the Kimberley and says "The Kimberley coastline measures some 13,000km, with giant natural harbours, 2,600 islands and massive rivers and mangrove forests. Marine scientists are only just beginning to explore this vast realm and it is safe to say that every expedition on-board the TRUE NORTH is a voyage of discovery but particularly the Kimberley Ultimate where we have the time to go that little bit further into the unknown!"